The Collab Blog: Travel the World Without Leaving the Classroom! Second in a series of our staff-led Institute Day blog posts. 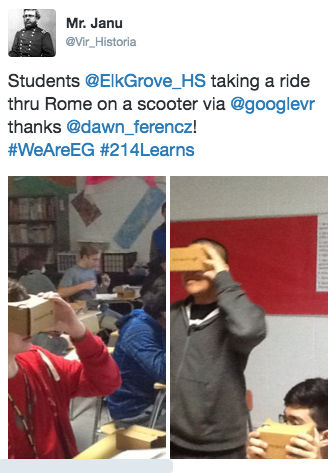 Imagine feeling like you are REALLY climbing a mountain, or REALLY riding a scooter in Rome, but you are just in your classroom using nothing more that a carboard "box" and a cell phone. 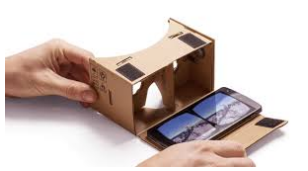 Thanks to virtual reality, and Dawn Ferencz's Institute Day session, we learned how to connect to the world outside our classrooms with Google Cardboard viewers. 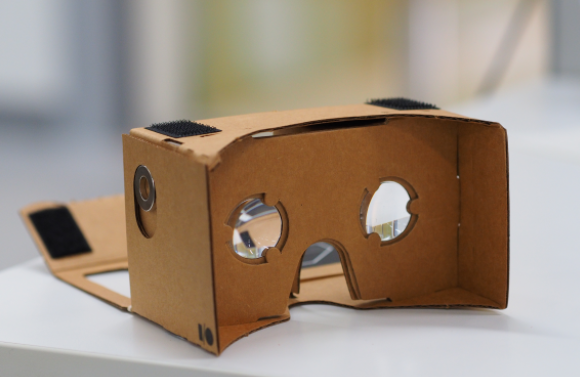 - Prepare your phone for use by removing the case to allow the google cardboard viewer to close completely. - Select an app to download or a video to view. See the suggestions below. - If you are watching a video, make sure to choose the cardboard option before watching the video. This will split the screen in two. Here is a handy classroom handout to use with your students! - English: using these viewers in small groups in class to share information about South Africa for teaching Power of One. - Foreign Language: Students can check out cities,museums, etc. - Human Geography: displaced children, exploring cities, food shortages, etc. - New York Times VR - Sponsored by The New York Times, this provides current event features as well as historical perspectives and opportunities to take virtual tours. Some content is also provided in Spanish. Additionally, there are print articles. - Google Cardboard - This is the "official" app for Google Cardboard and provides demo for users to practice standard VR options. - Expeditions - Created for classroom use, students can take virtual field trips to almost anywhere. - Street View - This also provides for virtual field trips but also includes user content. Additional links to resources can be found here. If EG teachers are interested in seeing these in action, please contact the Collab Lab!